Universal Studios new Hollywood Rip, Ride, Rockit Roller Coast is quickly taking shape and is now visable from City Walk. 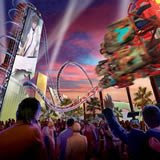 According to Universal Studios, the Hollywood Rip Ride Rockit will stake its claim as the most technologically advanced roller coaster in the world when it is completed in Spring of 2009. 3. 6 Near miss moments - Just to keep you on your toes! Like most Orlando theme park rides, the Hollywood Rip, Ride, Rockit has a theme based around an area called Production Central where Hollywood meets Orlando. Other details will be forthcoming as the opening gets closer. We are very excited about this opening, as there never seem to be enough roller coasters in Central Florida! It's great to see a new ride at Universal Studios Orlando. I look forward to riding the Hollywood Rip Rock it soon.